I think I shocked alot of people when they found out I was heading to Dallas for the Super Bowl. And, as usual, they were even more shocked once they learned I was travelling there without a ticket to the actual game itself. My philosophy was quite simple. 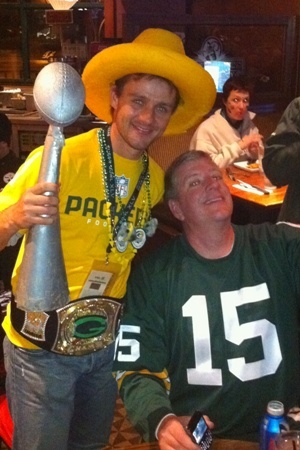 I’m a Green Bay Packer fan from a land where most people couldn’t care less about football. The least I could do, with the Packers in the big dance, was fly to a place that’d be partying all week long as a result. If I lucked out and scored a ticket to the game then great. If I didn’t then I’d at least have dozens of bars with thousands of Packers fans to party with and really soak in the atmosphere of what could be a monumental night. So I guess it was about 1am before we made it back to our hotel in Farmers Branch on Super Bowl night. And low and behold, Mike’s Sports Bar and Grill was still open next door. So as not to kill the mood off too quickly we, that is The Brunners and I, thought we’d pop in for one more beer before we called it a night. It’s always fun hanging out with these guys and despite the fact that I thought we were risking life and limb by being at such a place, in such an area at that time of night I enjoyed the hour or so all the same. After a weekend and 2 good nights of sleep I can happily say I feel like I’m back in the land of the living. YT SBXLV 5 Game Day!